Marilyn Cornwell Blog: Baby Types? Did you know there are 4 main temperaments of babies? "With time, the excitement that used to ignite her shrieks will start a bubbly flow of giggles. So if you have a challenging baby, don’t lose heart. Passionate infants often become the biggest laughers and most talkative members of the family. (Hey Mom, look! Look! It’s incredible!”) And sensitive infants often grow into the most compassionate and perceptive children. (No, Mom, it's not purple. It’s lavender.”)"
Another article described 9 temperament traits: activity, regularity, initial reaction, adaptability, sensitivity, intensity, mood, distractibility and attention span and persistence. This comes from parentingforbrain.com. Once we become adults, the research articles on personality types become more complicated. Are there 2,4,5, or 8 types of personalities? It does seem that we are clearer on babies and less so on mature humans. "We remain recognizably the same person," Nave said. "This speaks to the importance of understanding personality because it does follow us wherever we go across time and contexts." 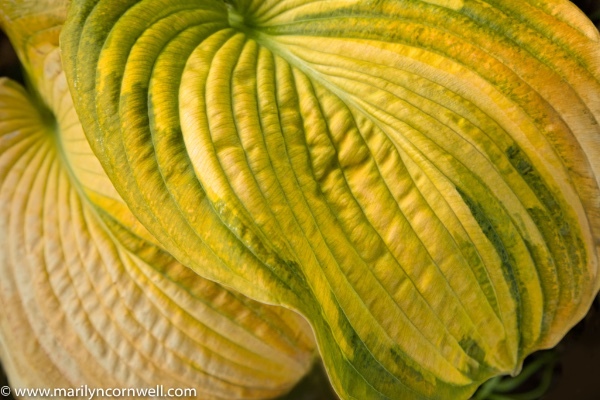 Our picture today shows the texture and details on the surface of a fall hosta leaf.